RBTH presents a selection of views from leading Russian media on international events. Today, Russia and Ukraine trade barbs regarding responsibility for the failed peace process, as well as over perceived strategies and lines of demarcation and a Russian paper argues that Ukrainian President Poroshenko changes his political face depending on unfolding events. The Kommersant business daily writes that the escalation of the conflict in eastern Ukraine has intensified the diplomatic standoff between Moscow and Kiev, with each side pinning the blame for the failed peace process on each other. Less than 24 hours after the Ukrainian military was ordered to attack, the Ukrainian Foreign Ministry offered to immediately sign an implementation schedule for the Minsk agreements with Russia. According to Kiev, this would make it possible to put a stop to the military action. In response, Russia urged Ukraine “not to engage in rhetoric” and called on it to confirm its desire for peace by removing heavy weaponry from the conflict zone. Commenting on the unfolding diplomatic duel between Kiev and Moscow, political analyst Mikhail Pogrebinsky highlighted Ukraine’s attempt to seize the peace initiative. “There are some positive moments in the Ukrainian Foreign Ministry’s statement that give off an understanding that we are moving towards peace. However, the drawback is that the Foreign Ministry is maintaining its aggressive rhetoric and accusing Russia of lying,” Pogrebinsky said. Another important point is that “both sides are talking about the execution sequence for the Minsk agreements and that these statements are being made in public,” he said. Meanwhile, according to Ukrainian authorities, the line of demarcation between the warring parties in the conflict zone is not being fully applied, and it is not defined in the area of Donetsk airport and on some other areas adjacent to the capital of the [eastern Ukrainian region of] Donbass. That is why a letter to Ukrainian President Petro Poroshenko by Vladimir Putin, which was made public on Jan. 18, suggested that Ukraine and pro-autonomy forces agree to a ceasefire and bring heavy weapons "based on the actual line of contact." “I hope that the warring parties sit back down to the negotiating table with mediation by the Organization for Security and Cooperation in Europe (OSCE) and Russia in the near future,” Maj. Gen. Yuri Netkachev (ret.) said. 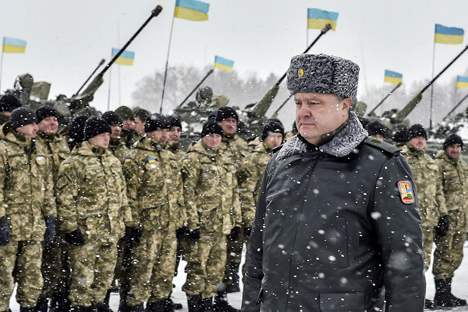 “That is extremely necessary for Kiev, which is back to incurring losses in the Donbass. But obviously, a ceasefire and the simultaneously announced mobilization are mutually exclusive things. This is preparation for a new war. If, as is expected, 50,000 reservists are called up, the number of Ukrainian troops will be the largest in the entire post-Soviet space by April 2015,” Netkachev said. The tabloid newspaper Moskovsky Komsomolets аrgues that Ukrainian President Poroshenko has been perceived as a leader without a clear political face since his inauguration in June 2014, alternating often between war and peace depending on unfolding events. “The only thing that could force the leader of the Kiev regime to seriously come to an agreement with the rebels about a compromise would be a complete lack of other alternatives. But right now there are ‘other alternatives,’ and in Poroshenko’s eyes, they look very promising,” Moskovsky Komsomolets writes.